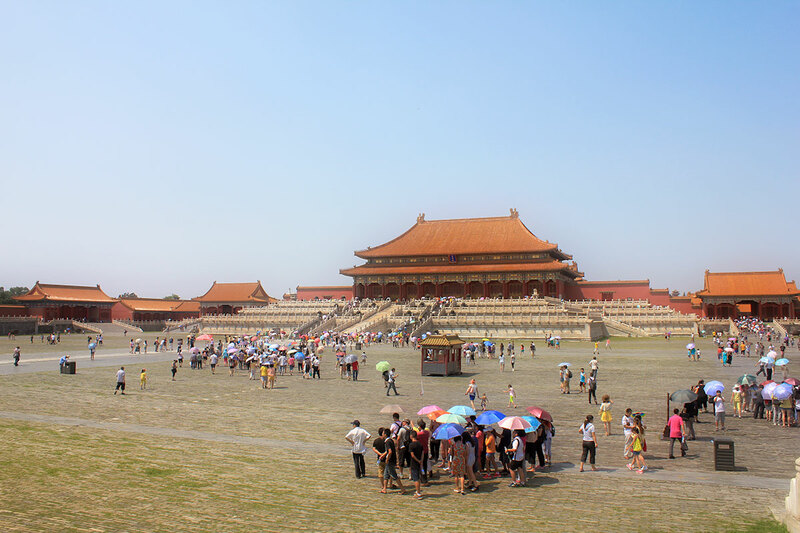 Forbidden City (故宫; Gù Gōng) is a former imperial palace, also know as the Palace Museum. In the Forbidden City, you can enter only through the south gate (Meridian Gate; 午门; Wu men), but you can exit through north (Gate of Divine Might; 神武门; Shenwu men) and east (East Prosperity Gate; 东华门; Donghua men) gates. West gate (West Prosperity Gate; Xihua men) is restricted to staff. Forbidden City (故宫; Gù Gōng) was built during the Ming Dynasty in the period from 1406 to 1420. Year after this, the capital city of China moved from Nanjing to Beijing. It’s complex architecture that resembles typical Chinese traditional style served as an example and influenced many further architectural developments in Asia. The dominating color is yellow since it is the royal family color. Located in the center of Beijing, it consists of 980 buildings and covers 720,000 m2. It was also a political center of the Chinese government and served as the home for the emperors for about 500 years. It got its name the Forbidden City because of the fact it was necessary to get the special permission of the emperor to enter and see it. It is surrounded by a 10 meters high wall and a 52 meters wide moat. According to the legend, there are 9,999 rooms in the Forbidden City, but this is not true, as there are about 8,700 rooms. It was said that more than a million workers worked on building it to the perfection. This imperial palace, which is today turned into a museum, gathers thousands of tourists daily, and it is impossible to visit it without being a part of a huge crowd. As a tourist, you will not know where to look first. Painted decoration, with magnificent colors and shapes, grand halls, with their treasures are something that will impress you, and it is impossible to go through it without feeling the true power of the emperors that lived and ruled from there. The palace is divided into three main areas, and they are; the outer gates, the outer court, and the inner court. The first area includes all the gates that surround the palace, starting from the first one on the south, known as Meridian gate. The second area is the official part of the building; the place where ceremonial and other halls are set, while the inner court is a private part, with the rooms of the king, his family and other important members. The fact that Forbidden City was declared a World Heritage Site in 1987 speaks enough about its importance for Chinese history and culture, and it is obvious why it is a must visit place in Beijing. Be aware that maximum 80,000 tickets will be issue daily. There are information desks at the entrance, Gate of Supreme Harmony, Archery Pavilion and north gate. You can take a tour guide at the entrance, but very good automated audio guide may be a better option, because knowledge of history and English by many of guides is questionable. In addition, audio guides are cheaper. Audio guide can be rented at the entrance for a price of CNY40 (CNY100 deposit is required). There are more than 40 languages available. Forbidden City is accessible to wheelchair users. Wheelchairs, strollers, and umbrellas can be loan free of charge (deposit is required) at the entrance. You can also leave your luggage at the entrance. Toilets and refreshments in a form of water, juices, fruit, ice creams and snacks, as well as restaurants are available through the complex. ATMs can be found at the Hall of Clocks and Treasure Gallery. In some areas photographing and filming is forbidden. There is a parking near the East Prosperity Gate. Entrance fee: CNY60 (April to October), CNY40 (November to March); CNY10 for the Clock and Watch Gallery, CNY10 for the Treasure Gallery, CNY40 Audio guide.